The BabyDan Magnetic Drawer / Cupboard Lock is the perfect product for childproofing your home. Magnetic Locks help to prevent a child from accessing draws and cupboards or drawers containing dangerous fluids, knives, etc. This Adhesive Magnetic Lock from BabyDan is fitted with strong adhesive pads making it perfect for installation where screw fitting is not possible. The Baby Dan Magnetic Lock is the first adhesive magnetic lock to secure dangerous items out of the way of young children. The lock is invisible from the outside and is easily opened by adult using the magnet key. Magnetic Locks must always be installed according to instructions. 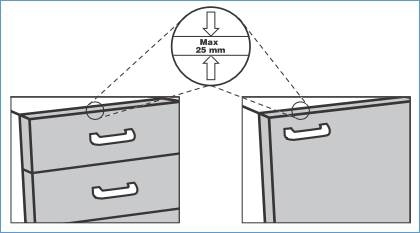 Note: Maximum thickness a cupboard door/drawer before the lock is 25mm. My husband told me about these magnetic locks and it works very well. It kept my cabinets and cupboards protected from little fingers trying to open them. I love it! Fitting is easy 5 minutes - But you must look at the instructions very carefully. The adhesive is strong enough that i didnt need the screws, so no damage to the kitchen. I hope the inventor of this product is very rich, they deserve it. These locks are amazing.......and so easy to fit! Would be lost without them! These Babydan Adhesive Magnetic Locks are really good, have a very inquisitive toddler girl so been a godsend.